I experimented taking it (the Brompton, not the adventurously wayward clergyman) to Scotland and immediately didn't ever again. Twelve miles of Sutherland hills exceeded my Brompton-wimp quotient. A Brompton I concluded is strictly an on-and-off-the-train machine. Accordingly I lent it to various people most of whom returned it unmaintained and went off and bought their own. One of these souls was my wife's brother. When your student daughter conceives a need for a Brompton in London you dig it out and prepare to pack it up for shipping but recalling that her enthusiasm for bicycle maintenance doesn't greatly differ from her uncle's, you decide to attend to the rear mudguard stays yourself because you have a creeping suspicion that spares, necessarily specific to the machine, will not be cheap. - I wonder if Andrew Ritchie has moved on to stainless steel for mudguard stays? - Mine is an early Brompton. Removing the mudguard tests your vocabulary and illustrates the tightness of all the clearances, no doubt to enhance its folding diminutiveness. 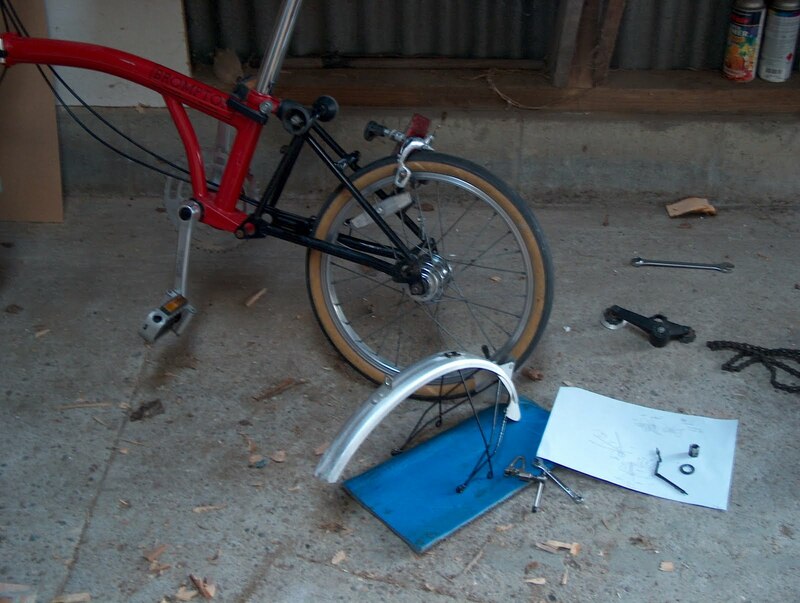 Removing the stays from the mudguard involves sheering off the bolts because rust is a form of welding. Undercoating them reveals the shocking fact that I am just fantastick'ly stupid. You know, really, really stupid. Stupider than Dr Phillips's son at school who once took a large sheet of copper and bent it in half merely because the metalwork master wasn't in the room. You would have thought, wouldn't you, that I would know by now that wet paint is wet, and it's paint, and you don't touch it. But no. I am so stupid that I think I can pick freshly painted things up and not have to spend hours rubbing zylol and acetone all over my fingers afterwards. I am not monumentally stupid. I am globally stupid. Reassembly reveals the reason why the entire population of London - what, ten million people - are employed at the Brompton factory. First, you discover - which you didn't realise when you pulled the thing apart - that each stay is a unique length, and since you didn't note which was which you have to start from First Principles and work out why and therefore which stay goes where. Then you need to hold the mudguard, and the middle stay, and the outer little thingy with two plain holes in it, and the first stainless steel replacement 5mm bolt, and the inner little thingy with two 5mm tapped holes in it. And a spanner. Which you have to turn using the sixth hand you grew for the purpose. Which won't like turning because the stainless steel bolt is now trying to get into a tapped hole freshly plugged with paint. - So that's either everybody in South Kensington in a job putting on the middle rear mudguard stay, or it's the reason why those Indian johnnies have that god with all those arms sticking out. And that, boys and girls, is why nobody who ever borrows your Brompton ever does any maintenance. And it's also why next time I'm not going to lend my brother-in-law my Brompton. I shall give him one instead. Then he can worry about rusting galvanised mudguard stays, and I need not suffer post-traumatic stress if it suddenly occurs to him to weld parts of the frame together.